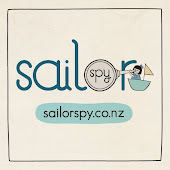 So most of you know or have figured out that I'm the designer behind sustainable brand Sailor Spy. Part of my journey in fashion was developing a philosophy around personal style rather than dictating to people what they should wear. Fashion should be fun - its all about self expression, but so often I think we are overwhelmed by what doesn't suit us but which we feel we are told we should love. A fair proportion of my wardrobe contains treasures from either an thrift or consignment store, scored at a local artisan market, in an online auction or at clothes swaps. With that in mind to enter the giveaway simply tell me one fashion or beauty thing you're lovin' this winter (that makes you feel a million bucks). It could be a favourite accessory or garment, it could be refreshing your hair colour or buying a new nail varnish. Please make sure your profile is email enabled or leave my your email address in the comments so that I can contact you if you win. You can score an extra entry by sharing on facebook, twitter or pinning one of the pictures from this post - just be sure to return and leave me a separate comment that you've done so. The competition will run for a week, until next Tuesday 30th July. The winner will be drawn using random.org and announced on the blog Wednesday 31st July. Sorry international folks - this is open to New Zealand entrants only. Linking in with Kelly today who is talking about uniform - I guess this winter you could say my mantra is 'put a scarf on it' I feel super snug with a scarf and have amassed myself quite the collection. Great giveaway! I am loving oversized snuggly jerseys this winter - nothing like being warm and comfortable when it's cold outside. I'm loving my thrifted Merinomink jumpper, it's charcoal and oh so soft, the bonus is it seems to go with everything too! Love those shiny shoes! and your circle skirt, so flattering :) My fav this winter has to be my new dark navy coat, I can throw it over anything and I instantly feel more dressed for it, even if I have my gummies on! I have rediscovered black eyeliner! Sometimes just on its own, other times with a light eye shadow. Team it with red lipstick. Simple but classic. It brightens up my face and goes great with the charcoal greys, blacks and browns that I like to wear in winter. I'm loving my handknit socks and shawls. oh dear. i'm rather languishing in the nothing fits still, tracky wearing spewed on doldrums. but beneath all that, when i put on my boyish vintage hermes watch i feel a bit more upright, and tanned and even a little slimmer. there is a glimmer of hope for me yet! Can I be naughty and choose two things? The first thing that sprang to mind was my new short hair. I am one of those people who gets a real sense of freedom when I cut off all my hair I get bogged down by long hair and cutting it all off gives you nothing to hide behind. I'm still at the stage of loving it, but just wait a few months and I'll get bored of it. The other thing that I'm loving is my leather knee length boots. Can you believe that I reached the age of 40 without having ever had a pair of long leather boots (they would never fit over my rather large calves)?! They are so warm and snuggly that I never want to take them off in the evening! I love how they look with a skirt! Love that mantra - and MUSTARD! My favourite item this winter is my mustard cardigan - everytime I put it on I feel on trend and like I'm shouting my self expression (mustard being a colour many people shy away from). Thank-you for joining up with Wardrobe Wednesday and for doing such a nice thing with the give away. Fingers crossed! I feel so good when I put a pair of cute earrings on, a pair made by me, just for me, just the way I like them, in the colour I want. My latest go-to- pair for dressing up a casual outfit is my FAVOURITE chocolate brown crochet earrings. They make me feel like a lady. I just shared this on my facebook (Holly May Bruce) OH, how I would LOVE a Westfield Voucher to spend all on only me! Another thing I like to wear at the moment is my infinity scarf. I crocheted it from some wool that my mother gave me. It does look good and it's a great feeling to wear something I made too. I'm loving my oversized thrifted Adidas plaid artists smock/shirt dress. I can layer Merinos underneath. Its bright and colourful to cheer me up on gray days... Don't need a high vis vest on when out riding my bike on Chch city streets, and hides all the post baby lumpy and bumpy bits that I'm still working on 2 years down the track! My red coat. It always makes me look fashionable irregardless of what I'm wearing under it :). It all add colour to a dull winter day. I think I'm a scarf-a-holic, practical and stylish at the same time :-) A new cut and colour for Winter and I'm good to go! Lovin my large scarf/pashmina, can wear it all day if cold or just as a scarf on the way to work. Thanks for the chance. My favourite items this winter are socks knitted by me and merino tights made here in New Zealand! Made a big difference to keeping warm! 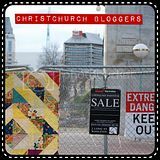 My favourite items are my angora yellow jumper from a thrift store - it isn't a colour that I would usually choose at all and an upcycled vintage pink check coat. I just love to wear bright colours, particularly in winter. I even experimented with a new hair colour but that was maybe a step too far as it affected my whole wardrobe. I've had lots of nice compliments about the jumper and coat though, even from little Miss X and compliments from her are as rare as hen's teeth! New winter boots - from Head over Heels. Very cool, and love the way they mod up all my vintage/second hand clothes. My favorite items are my snuggly bright red winter coat - it goes with all my outfits and is an amazing pure wool op-shop find for $10. Shared on Facebook as well :-) Blessings to you and yours. Im loving my coat! Its burgunday, with toggles and a hood.. I dont know what shop its from originally because i got it second hand. But its awesome!